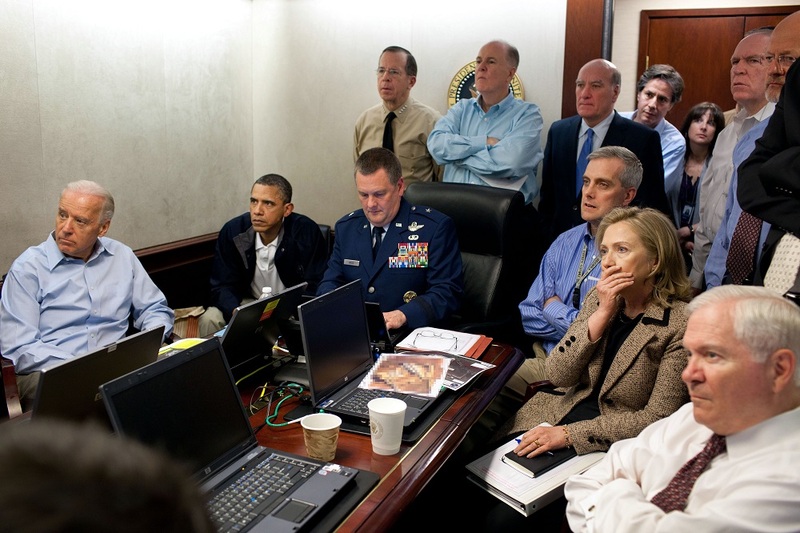 This famous photograph shows senior officials waiting for an update on the bin Laden raid, an event Hersh alleges was all but scripted. Four years ago, President Obama announced that U.S. forces pulled off a targeted killing of the new millennium’s most wanted man, Osama bin Laden. Media and celebrities poured praise on Obama and expressed closure on behalf of the entire nation at the death of a man believed to be responsible for killing 3,000 Americans. Now, Seymour Hersh, a veteran investigative journalist whose previous exposés uncovered military atrocities at My Lai and Abu Ghraib, has challenged the official account. For years, the nation accepted that bin Laden was the world’s slipperiest man, and that the final victory over him was the culmination of an incredible collaboration between U.S. intelligence and highly trained Navy SEALs. This narrative has even been made into books and a major movie. According to Hersh, however, Pakistan had been keeping bin Laden prisoner at the compound in Abbottabad since 2006. In 2010, someone in Pakistani intelligence tipped off U.S. intelligence to bin Laden’s whereabouts in exchange for part of a $25 million bounty. Then, U.S. and Pakistani intelligence devised a raid that left virtually nothing to chance. Power was cut to the city. Pakistani officials cleared the airspace for the Navy helicopter. Bin Laden, contrary to the official account, was not armed; there was no firefight. The assassination of bin Laden was, almost as literally as possible, shooting fish in a barrel. The entire essay, published in the London Review of Books, is highly detailed and more than 10,000 words long. But for all his laborious accounting, Hersh’s bin Laden revelations are largely inconsequential. For one thing, it’s not hard for the White House, government officials and much of the press to wipe them aside. The media quickly labeled Hersh’s report a conspiracy theory and turned his feud with the Obama Administration into a “he-said, she-said” exchange. In a news environment where officials are deferred to as authoritative, this essentially means being discredited. Whether they’re true or not, getting people to believe Hersh’s claims is another matter entirely. Even if Hersh convinces everyone, it doesn’t change much. Bin Laden’s assassination was a big cultural moment, and actually quite a bizarre one. It uncovered the nation’s Biblical revenge lust, with almost no one bemoaning the fact that bin Laden will never stand trial for his crime. We shrugged off the strangeness of dumping his body into the ocean – another point of Obama’s account challenged by Hersh, making it a pretty macabre fabrication for the State Department if Hersh’s report is true. But historically, the bin Laden assassination will be lucky to end up a footnote. His cultural significance vastly exceeded his importance in geopolitical affairs, especially by the time of his killing. Hersh’s report has a great deal more plausibility than conspiracies surrounding the Kennedy assassination, the lunar landing and 9/11. But, like those events, spending tremendous time and resources to prove or disprove it is only a minimally useful effort. To prove it true is simply to add it to an already lengthy list of state crimes and deceits which are widely acknowledged. 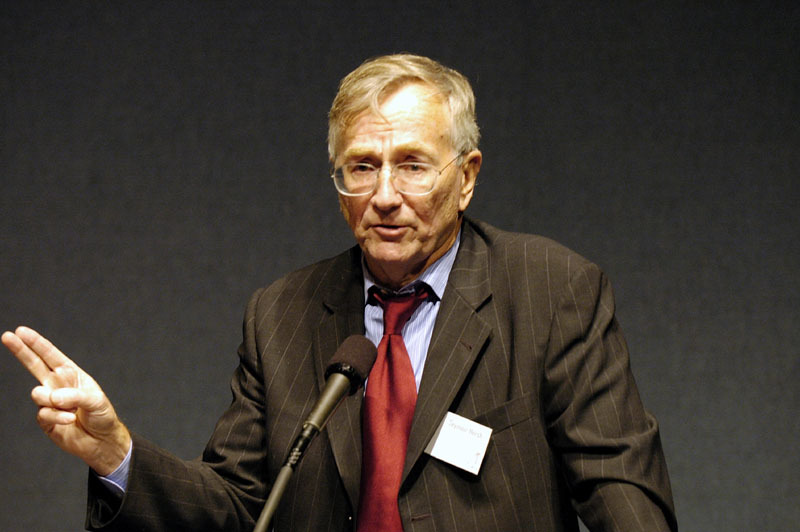 Seymour Hersh speaks at the 2004 Letelier-Moffitt Human Rights Award ceremony. To further demonstrate how incidental Hersh’s account is, just imagine if it’d been told as the real story all along. It may not have been as glamorous, but there would have been no outrage here. Which begs the question: why the ruse? Likely, the cover-up was for the benefit of Pakistanis, who disapproved of the bin Laden raid anyway. They’d have been even more incensed knowing their government handed over bin Laden on a silver platter and authorized a U.S. attack in their own land. But domestically, the government has a need for flag-waving propaganda. Where it can’t procure it organically, it will concoct it. Bin Laden’s killing wouldn’t be the first proud American victory to, on closer examination, turn out to be a falsehood. It’s long been a history lesson in American schools that the Cuban Missile Crisis, an event that brought the world as close to nuclear war as it’s ever been, was averted thanks to the cool-headedness of President Kennedy. This couldn’t be further from the truth. In reality, a U.S. flotilla had been antagonizing Russian nuclear submarines in international waters near Cuba. It was Vasili Arkhipov, the second-in-command of a Russian sub, who vetoed a torpedo launch and contained what might otherwise have been a truly world-changing event. Pat Tillman, the man who gave up a lucrative NFL contract to join the military, became a high-profile propaganda centerpiece during the Bush Administration’s effort to win the public over on the 2003 invasion of Iraq. The official story held that Tillman died serving his country, a model of selflessness and patriotism for us all to learn from. What’s often omitted is that Tillman opposed the Iraq War, signed up specifically because of 9/11 and saw no link between it and Iraq, was a big fan of Noam Chomsky, and was fragged by friendly fire. Official versions of events like these are intended to give the government some morale-boosting propaganda. You can be revolted by the cynicism of it, but it’s so commonplace that there’s really nothing even particularly scandalous about it. Facts matter. It’s important we understand what really went on during the Cuban Missile Crisis, My Lai and Abu Ghraib. These are teachable moments that represent some of our most profound and systemic moral failings. But there’s little for us to do with the bin Laden revelations, true or false, now that they’re out. Some seemingly important news stories simply distract us. The Watergate scandal, for instance, hogged headlines that should’ve been given to revelations about the FBI’s secretive COINTELPRO. As opposed to the front-page murder mystery of bin Laden’s killing, the American public would be better served being informed about our crumbling infrastructure, shabby healthcare, Gilded Age economic conditions, police brutality, industry’s annihilation of the planet, and other issues that affect the real lives of many people. Stories less meaningful than Hersh’s have dominated the media, and we should never simply excuse lies from the state, but the lie exposed by Hersh is just not that important.